It was important to Frank and Elizabeth that Illahee look attractive to visitors and campers alike. They began with small things that improved the appearance immediately. They planted flower gardens around camp to offer color; they blacktopped the old concrete tennis courts and built stonewalls to neaten and add definition to the property. They moved their office from the basement of their home to Curtis and weatherized it to allow for year round use. A three-year plan was set in place that would phase out the old cabins with new cabins built on their footprint. They began with one cabin on Hillbrook. When the girls returned to camp the next summer they dubbed the new cabin the “condo-cabin” for its relative comfort and spaciousness. Over the next three years they would replace all the cabins around the lake offering campers newer and safer living arrangements. As with past Directors, Frank and Elizabeth saw the expanding facility needs of Camp Illahee and worked to meet them. By the time they completed their work at Illahee the camp had the look of a beautiful, well laid out and maintained facility that everyone affiliated with could be proud. The Riding Program at Illahee had always and continued to be a favorite activity for the girls. Over the years Illahee had become known for the quality of riding instruction the girls received. But there was one condition that continued to hamper the activity — rain. Ren and Liz Bannerman had offered Illahee their expertise in riding for nine summers. They wanted to expand their program to a year-round operation but the weather was fickle and the need for an indoor riding ring became apparent. 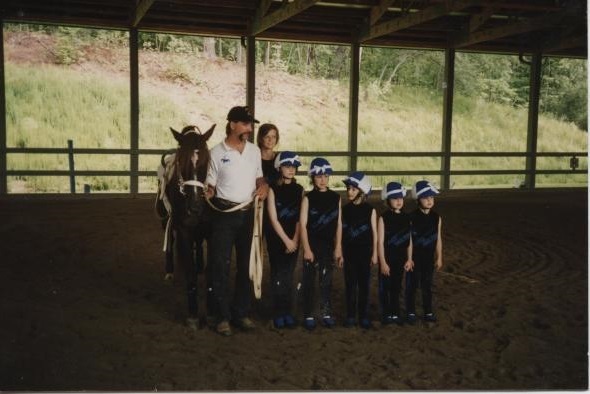 In 1993 ground was broken for a covered riding ring that would serve both purposes: a year-round riding program and a place to ride in inclement weather during the summer. After its completion Illahee had a place to continue to ride even in the heaviest rainfall. Frankie had initiated a program that was proving to be very popular – woodworking. The girls found satisfaction creating gifts for their parents such as a toolbox for Dad or a garden stool for Mom. The program activity was originally housed in Pinebranch, the small cabin located next to the Director’s home. This space worked well until the need arose for the Sparks to have their own cabin in which to live together. Woodworking then moved to what is now the Laundry Room underneath the Dining Hall. The ceilings were low and the noise was nearly unbearable, but even with all the drawbacks the activity continued to grow in popularity. In 1991 plans were drawn up to build a new Woodworking shop that would incorporate the latest equipment, offer nearly triple the space, and with the large sliding doors on either end, allow for a much better ventilation. In the off-season the Woodshop would also serve the needs of camp as it expanded. The building had a design similar to the PBS show The New Yankee Workshop and blended well with the look of camp. Sitting on the knoll across from the Dining Hall stood the venerable old building known as the Wishing Well. It had been the place to aid the illnesses of campers for nearly six decades but it was small and cramped and the time had come to create a new more spacious building for Illahee. A new two-story Wishing Well was designed to be a place of comfort for campers and a residence for the volunteer nurses who came to be a part of camp each summer. With a porch for sitting, a kitchen to dispense medicines and a large living area to relax in, as well as offering the needed bed space for sick campers, it also had the advantage of being a “guest house” for visitors during the off-season. The official opening of the Wishing Well took place in 1997 and has become an integral part of today’s Illahee.